A mediocre crime novel. Reminds me of the Shell Scott novels that I read in my youth. An alternate history, this story is set in the years after the Germans strike a peace with all but the Soviets. A killer is on the loose in Berlin and he may be one of the infamous Nazi leaders...a real page turner as the detective Xavier March, an investigator working for the Kriminalpolizei (investigates the suspicious death of a high-ranking Nazi. Along the way we discover the Gestapo is eliminating the remaining officials who planned the Holocaust. The final scene takes place at the now unmarked site of Auschwitz's completely dismantled extermination camp. 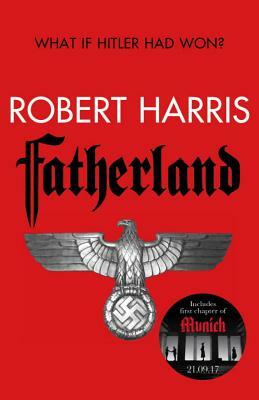 In either event, there are things about Fatherland that are "typical" thriller mystery elements. A policeman (Xavier March) investigates a body found in a lake near a wealthy neighborhood, and in doing his job, uncovers a decades-long secret that touches across powerful men everywhere. It's well told and a decent plot, but it's made all the more interesting by the major twist that is the overall conceit of Fatherland. That is, the book takes place in 1964 Germany after the Germans WON World War II. This is the premise, and it's unnerving how little needs to be different in that world to make it plausible. A few references to Hitler attacking Russia in the summer, and other details left unsaid, set the stage. The German population, including March, have been told that the Jews were "relocated to the East" and understand that follow-up questions to that are not allowed. Author Thomas Harris does a good job of showing the police state mentality, and how easy it is for them to dispose of people who do not fit into their agenda. It is appropriately scary, and Harris does a great job of delivering a message without beating you over the head with it. After all, there aren't many - scratch that, there aren't ANY reasonable people who need to be told why Hitler's defeat was a good thing. At the end of the day, Fatherland is a good thriller that sets itself apart from others in its category by the setting and surroundings. It's well worth the read.